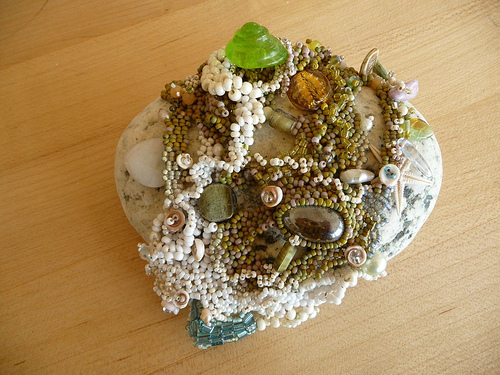 Yeah, sometimes I bead rocks I pick up off the beach. Wanna make something of it? Sometimes I even name ’em. This one I call Low Tide. I love your Star Svensdotter books. Great scifi and vision of the future (I hope it comes to pass! The good parts, I mean). Good level of technical detail–introduces intriguing ideas but doesn’t go too deep (where the reader can get lost or the ideas date themselves fast). The characters are realistic and interesting. This is way too cool. I want to do this now. Thanks, Cassandra, music to my ears. And Judy, thread your needle! It’s really neat…but where do you find the time?? Shiny! I would actually buy something like that. Very clever! Creativity needs to express itself in multiple ways in order to come to true fruition. I am very intrigued by your beautiful rock beading. I am off to Google more information on this art form. The rock isn’t drilled, Lou. There are several blasphemous hours stringing and weaving beads together around the rock. Then several more with even more interesting language tightening everything up so it doesn’t slide off while you get on with the embellishments.